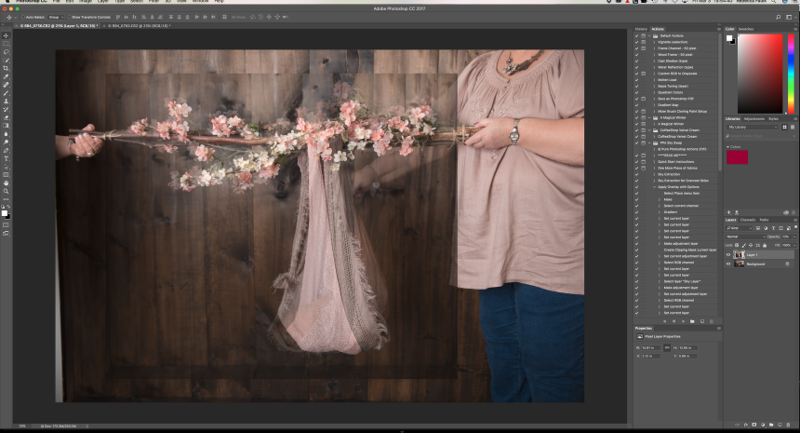 I have been getting a lot of curiosity and views on my posts of behind the scenes screen shots to show you the work that I put into a composite image. I do at least one for every newborn session and often many. I also use them for maternity sessions and milestone sessions. 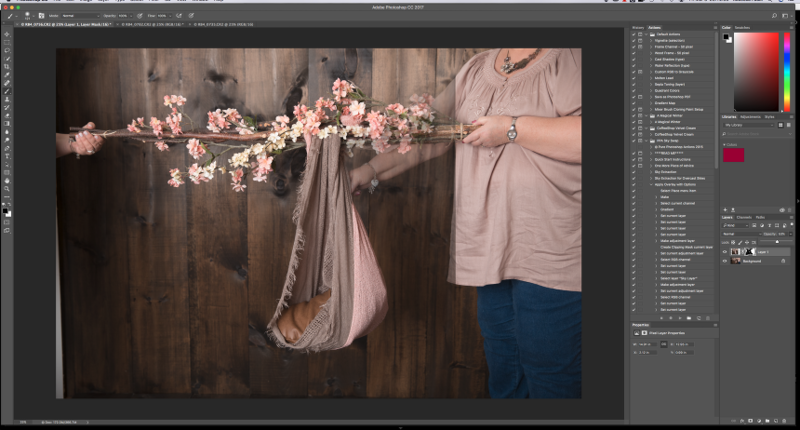 Sometimes I have had to use them for weddings – those are mostly for ease of editing and speeding the process along; with newborn and baby photography I utilize composites for SAFETY. Safety is always the reason and when you see the SOOC (straight out of camera) images you will see why. No child could or should hold them selves up by only their arms, wrists and hands and nor should they be suspended over something without a hand there to protect them and something below them. This is a photoshoot and safety should ALWAYS be the top priority of any professional newborn photographer. Those Pinterist fails you see all over the internet, not only are those that think they can do it on their own, they are also taking great risks with a very tiny life. I have started taking screen shots of what I am actually doing on the computer when I am editing so you can see for yourself the work that goes into it. There is A LOT of work, knowledge and stuff that goes into taking newborn portraits and one of the many reasons why you should know what precautions your photographer takes to keep your child safe during your session. Sharing here a few screen shots from me editing the images. Note the “scene” image the fabric swing was only filled with a beanbag to give it fullness. I had to extend the stick and cherry blossoms by quite a bit to achieve the look I was after. NOTE : The only image that actually has the baby in it there is a beanbag below her and I only needed an inch of clearance to get a free space below the baby. FINAL EDIT – After some warping and lots of re-building to get what I was going for – there she is sleeping from a brand of cherry blossoms ! Next one is extending the canvas – adding a wooden plank secondary to studio restrictions. I got the perfect smile and pose of big sister but because of the height of the stroller, I ended up with not enough of the wood wall behind them on the left. Last is a popular one – “froggy” or head in hands pose is ONLY performed safely with hands always on the baby. I lowered the opacity on the layers so you can see the two images that I used to make this composite. I also fixed the angle of the crown because when I completed it, something looked a little off so I used another image with the crown included and tilted it to my liking. Hope you enjoyed some magic and remember that what you see in the final image is not always shot as is in camera. Hiring a professional and SAFE photographer for your newborn session should be priority one. Too many photographers claim training and do not practice it when they are in session.